COLUMBIA, Mo. – In pets and people, the time it takes to diagnose an infection may mean life or death. Now, a University of Missouri veterinarian is identifying ways to diagnose pet infections in approximately a third of the current diagnosis time. The resulting test could be used eventually for humans. DeClue and her colleagues found that measuring the amount of the blood biomarker N-terminal portion of pro C-type natriuretic peptide (NT-pCNP) is a good indication of infection, and the same is true in humans. Working with collaborators at Veterinary Diagnostics Institute, DeClue hopes to develop a portable bedside test that veterinarians could use to quickly test patients for infection and ultimately target a better cure. “The systems in dogs and people are very applicable to each other, so whatever biomarkers we find in dogs could also benefit people,” DeClue said. DeClue has tested several biomarkers for infection in dogs. “Evaluation of serum NT-pCNP as a diagnostic and prognostic biomarker for sepsis in dogs” was published in the May-June issue of the Journal of Veterinary Internal Medicine and “Plasma nitrate/nitrite concentrations in dogs with naturally developing sepsis and non-infectious forms of the systemic inflammatory response syndrome,” was published in the November issue of the journal Veterinary Record. Co-authors include Kara Osterbur, a graduate student and emergency and critical care resident in the MU College of Veterinary Medicine. 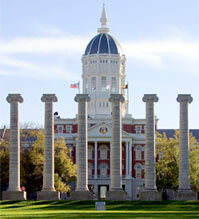 The research reported in the published papers is part of Mizzou Advantage, the five unique areas that set MU apart from other universities. The project contributes to the “One Health/One Medicine: The Convergence of Human and Animal Health,” which expands on MU’s pioneering work in the convergence of human and animal health and connects it with research and instruction in health care delivery, health policy, medical ethics, health care business models and the culture of healthy living.